Borough of Poole: Pure Town Planning are delighted to report that planning permission and listed building consent has been granted for the residential redevelopment of the Mansfield Road Water Tower in Parkstone, Poole. The water tower in Mansfield Road, Parkstone is a Grade II listed building designed in the Italianate style and completed in 1884. The tower has been redundant for many years save for hosting a number of antenna. With the fabric of the building beginning to deteriorate it was necessary to find a long-term future for the tower. This conservation-led scheme was designed by David James Architects for our client Nest Homes.The scheme involves the construction of a contemporary new-build apartment block to the rear linked to the tower by a lightweight glazed structure. Pure Town Planning worked closely with the planning and conservation officers at Borough of Poole which led to the evolution of this scheme throughout the planning process. As is encouraged by National Guidance, pre-application advice was sought in early 2017. The planning officers responded positively to a redevelopment scheme on the site, confirming that because of the close proximity to the commercial centre on Ashley Road, a flatted development would be acceptable in compliance with Policy PSC 5. 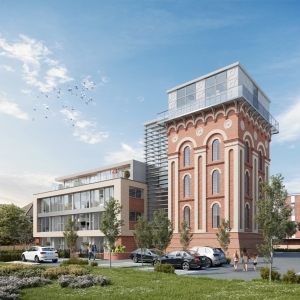 The new build part of the proposal was deemed to be of an appropriate scale in the context of its neighbours and in relation to the scale of the existing water tower. The proposed building reduces in height to the rear to respect the houses behind. The proposed palette of materials, included the use of buff and red brick to echo those materials found on the water tower. This reduced the visual scale and mass and broke up the proportions of the new build, to successfully integrate the old and contemporary elements of the building to form a respectful redevelopment of this prominent local landmark. In terms of amenity; the planning officer comprehensively assessed and set out in her report why the relationships between the proposed building to all nearby properties on Weymouth Road and Belmont Road were acceptable and would not leading to any harmful shading, loss of light or overbearing impact. The site around the water tower is currently a Council-run car park, however the site is private land and the Council’s lease and use as a public car park expires in August 2018. As there are no planning policy requirements to retain the car park for public use, and several other public car parks with capacity are available to serve the Ashley Road local centre and Health Centre, the highways officer found the proposal acceptable. Concerns were raised by local residents in relation to parking for the patients of the health centre. Members of the planning committee saw on their site visit that the health centre benefits from having its own parking area underneath the building – over 30 spaces. Whilst these are currently solely for use by the staff, it was suggested that it would not be unreasonable for a proportion of these spaces to be allocated to patients in the future. Planning permission and listed building consent was approved at the Borough of Poole Planning Committee in April with many of the Planning Board Councillors complimenting the design of the scheme. If you own a Listed Building and are looking to explore potential redevelopment opportunities, why not take advantage of our confidential, free of charge planning appraisal to find out if with a sensitive design you too can unlock development potential. Call us on 01202 585524 or email info@puretownplanning.co.uk for more information.